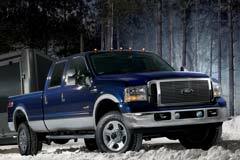 The 2007 Ford F-350 is quite strong and is capable of towing up to 15,000 pounds and carrying payloads of 5,800 pounds. On the other hand, it can tow 17,000 pounds on a fifth wheel trailer although its gross combined weight rating stands at 26,000 pounds. The F-350 has a dual rear wheel configuration which improves stability, especially when towing. Buyers can choose from the Regular Cab, Crew Cab, and Extended Cab body styles. It comes in two bed length; 6.75 ft and 8 ft. The Ford F-350 has three engine choices; the base engine which is a 5.4 L V8 that generates 300 hp and 365 lb-ft 6.8L V10 that generates 362hp and 457 lb-ft of torque. For serious hauling and towing, the best option is the 6.0L power stroke diesel V8 that generates 325 horsepower and 570 lb-ft. torque. All of these engines have a standard six speed manual though a five speed automatic is also available. A used Ford F-350 gives buyers the options of two-wheel drive and four-wheel drive. The crew cab is equipped with four full size swing-out doors, while the SuperCab model has small rear opening doors. However, the regular cab is configured to a long bed only, meanwhile the crew cabs and SuperCabs are available with a long or short bed. 2016 Ford F-350 -- 2016 Ford F-350, Silver with 33864 Miles available now!